Beverly's Official Blog | News and findings from world of crafts, scrapbooking and more: A Givaway! 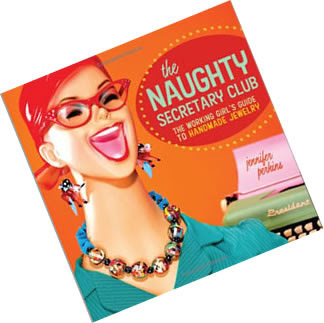 This month Beverly's has The Naughty Secretary Club: The Working Girl's Guide to Handmade Jewelry on sale for $13.44. But this weekend, we're giving away a signed copy. Just leave a comment, and we'll have a random drawing first thing Monday morning. How awesome! Hope I win! Thank You! I was just in last night for drawing supplies and will be by 11/28 for the Big Sale. Crossing my fingers I'll win the drawing in the meantime! PS Thanks for finally carrying Sublime Stitching Packets next to the traditionals. I Luv her stuff!! Looks like a fun book. Beads and Baubles, you won!! congrats! email us your home address to info@beverlys.com and we'll get it right out to you. Thanks all for participating.